When an open or short circuit is detected in the transponder key amplifier coil built into the engine switch, the certification ECU (smart key ECU assembly) stores this DTC. This DTC is also stored as a past DTC. The transponder key amplifier coil built into the engine switch is open (see below) or shorted (determined by communication with certification ECU (smart key ECU assembly)) (1 trip detection logic*). Terminal AGND, VC5, TXCT or CODE is open (includes disconnection of the engine switch). The transponder key amplifier coil built into the engine switch is open. With the shift lever in P, the key held near the engine switch and an engine start operation is performed by pressing and holding the engine switch when the key battery is depleted. *: Only output while a malfunction is present. Before replacing the certification ECU (smart key ECU assembly), refer to Registration (See page ). 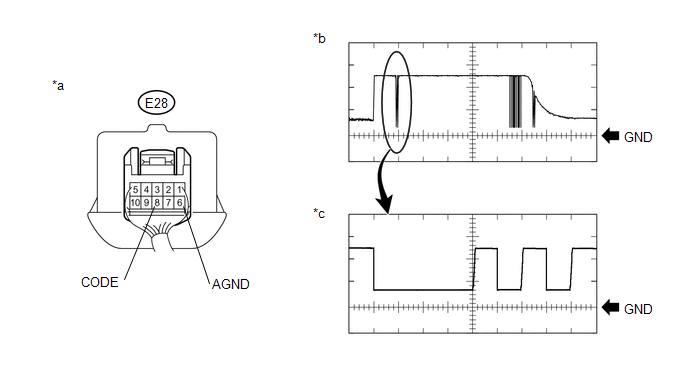 After performing repairs, perform the operation that fulfills the DTC output confirmation operation, and then confirm that no DTCs are output again. (a) Perform "DTC Output Confirmation Operation" procedure. DTC B2784 is not output. (a) Using an oscilloscope, check the waveform. *: Remove the key battery before performing this inspection. 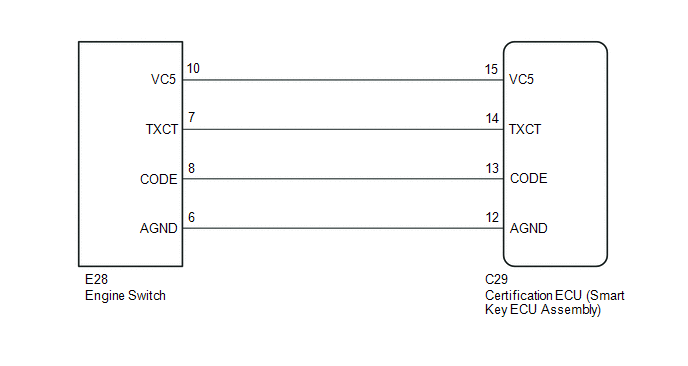 (a) Replace the certification ECU (smart key ECU assembly) with a new one (See page ). (a) Register the key (See page ). (a) Register the ECU communication ID (See page ).